As Google Partners we love to see the adoption of Google Apps and we love to see all of the updates! Managing a big address book can be a challenge, so it’s no surprise that the top request for Google contacts is a fast, easy way to merge duplicate contacts. You’ve been able to merge contacts one-by-one for a while, but now we’ve added a single button that merges all your duplicate contacts at once. 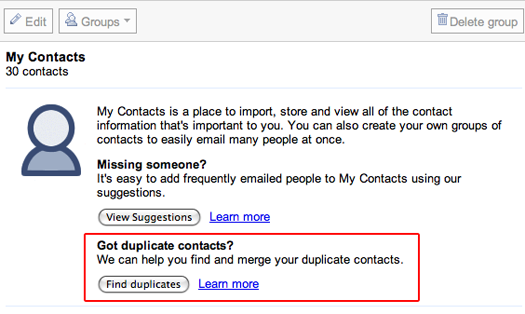 To clean up your contact list in one fell swoop, just click the “Find duplicates” button in the contact manager, review the merge suggestions (and uncheck any suggestions you don’t want merged), and hit the “Merge” button. If you’ve been considering getting all your contacts into Gmail or syncing your Gmail contacts to your phone, now’s the time to do it. As we’ve written about previously, you can sync your contacts to a wide variety of devices (including Android, iPhone, Blackberry, SyncML, etc). So if you were dreading spending hours getting your contacts in order, now you can do it with a couple clicks. This entry was posted in Google Apps, MX News on December 16, 2009 by MxToolbox Blog.